The Tarot Association of the British Isles provides support, information and resources, including free readings, for Tarot enthusiasts of all levels. Whether you are a beginner or an experienced reader - based in Britain, or abroad - you are welcome at TABI. Aeclectic Tarot: Dedicated to the diversity & beauty of Tarot. See images of Tarot cards, read reviews of Tarot decks and Tarot books, learn about Tarot, receive Tarot readings, visit Tarot links, or join our Tarot community. An exciting new development, Tarot World Magazine is a new quarterly publication "committed to adding to the body of knowlege available for the tarot community" with "titles and columns for beginners, intermediate students and the adept, as well as special topics of interest to all"
Exquisitely embroidered tarot bags, cloths and much more, available from stock or custom made to order from the Ania M online shop. Also bespoke couture garment design: specialists in corsets, cloaks, period styles and bridal wear. THE PASTEBOARD MASQUERADE includes some very fine reviews, card images and research. 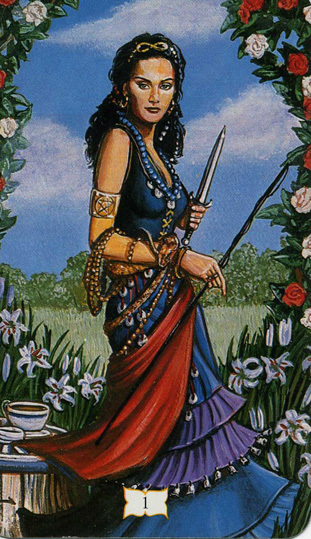 WICCE'S TAROT REVIEWS includes a large range of decks and some second opinion reviews, as well. The Tarot Association of the British Isles publishes THE TAROT READER, a free e-zine with tarot news, views and reviews. The e-zine is available to TABI members only, but THE TABI TRACKER - the Association's free monthly newsletter - is available to all. Select card label for free images - check restrictions of use! You can also check out the different styles of other TABI readers, all of whom have undertaken to read by The Readers' Ethics of the Tarot Association of the British Isles. Below are just a few such readers listed - for far more, visit TABI's Professional Readers page. This incredible deck, based on gypsy lives, is beautifully illustrated and a favourite reading deck of Tarot Source - the TS signature deck, in fact. Many thanks to its creators for the use of images from the deck for this site! Want to check out readings by the creator of Tarot Addicts, an endorsed Tarot Association of the British Isles Reader and Tarot Professionals Ace? 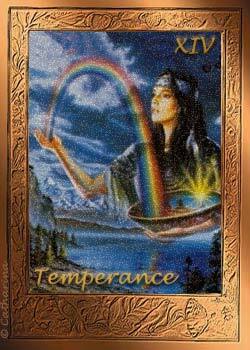 Visit Tarot Source Readings. Tarot Professionals, aka Tarosophy, is a new network for Tarot students, enthusiasts, scholars and readers. Benefits include a free tarot course to all members, massive tarot discussion area and readers exchange for free tarot readings, also a regular journal for Tarot Readers, member certificates and a professional logo. 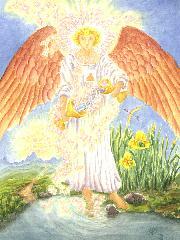 The Pearls of Wisdom Tarot is a beautifully vibrant and readable deck. The illustrator created the cards in a therapeutic way and they have a richness in meaning that is seen in the detail of the designs. Uses runes and other strong symbolism. Images shown here at Tarot Addicts are used with the permission of the artist, Roxi Sim.